From the Bestselling Time Travel Romance Author and Winner of the HOLT Medallion: Two Victorian Christmas romances plus a bonus Valentine’s Day romance, all in a single volume! Nathan Fletcher realizes too late how much his bride Emily means to him--only when he learns of her death. But can a Christmas angel intervene and grant the couple one final day to rediscover the glory of their marriage? 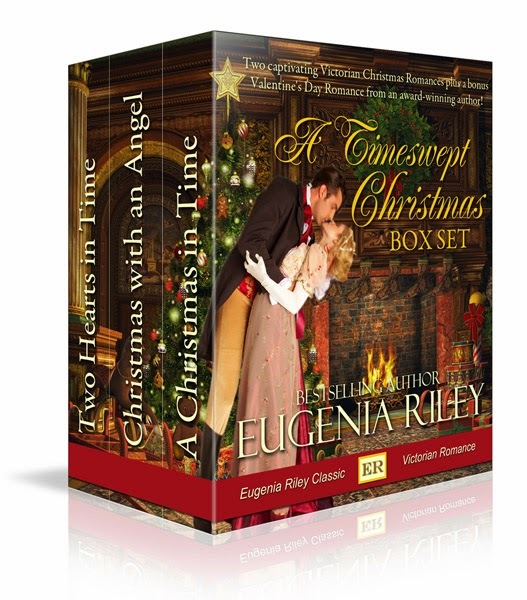 A TIMESWEPT CHRISTMAS BOX SET is a tender and touching holiday romance collection, perfect to curl up with on a cold winter’s night. Approximately 80,000 words. Eugenia Riley is the renowned, bestselling author of dozens of historical, contemporary, and time-travel romances, including the classics A TRYST IN TIME and BUSHWHACKED BRIDE. She has written for publishers including Avon, Bantam, Warner, Harlequin, and Dorchester. She has numerous romances available in Kindle. To Jason, it was as if no one else in the world existed but the two of them. He watched in anguish as a tear trickled down Annie’s cheek. The sight of her sorrow seemed to drive a lance deep into his very heart. “Sweetheart, please don’t cry,” he whispered in torment. “I’m going to break off my engagement with Stephen,” she whispered back, choking on a sob. Their kiss blazed like fire in the freezing cold night. Jason devoured Annie’s mouth, possessing and savoring her. She clung to him and kissed him back with equal ardor. To Annie, the moment was pure paradise—this man was everything she had ever wanted, her destiny. She felt a part of him, as if they were truly one, inseparable. Jason, too, felt the love, the deep bond between them, and only wished he could hold her this way forever. But she would say it—and thus Jason silenced her the only way he could, kissing her again and again and again, until both of them were feverish with desire . . . I love Christmas stories! Thanks for sharing it :). I like Christmas stories! Thanks for sharing. I love reading Christmas Stories! !